According to L2, more than 46% of hotels with Facebook accounts receive posts that deal with customer service. Past and future guests are taking their customer service woes to the web and are posting about problems that they experience at your hotel. Therefore, it is imperative that you stay on top of posts to your Facebook page with comprehensive real-time monitoring. section lives prominently near the top of your property’s Page and is enabled only for Facebook Pages that have physical addresses. (In other words, users cannot write recommendations on pages for brands unless the page owners provide an exact address in the pages’ About sections.) But, we encourage you to complete your address as Facebook’s recent rollout of Graph Search favors pages that have fully-completed About sections. While Facebook Page owners may worry about prominent negative feedback, we urge you to trust in the power of your fans. For most hotels, your loyal guests will be more than willing to share a tip or a compliment on their own volition. But, if there is a concerning piece of feedback that shows up in this section, address it directly as you would any negative review and you can neutralize any bad feedback by showing that you pay close attention to guest feedback. Also, you will often see that loyal guests will come to your defense to refute the criticism. That’s when the user-generated content system is really working! But, if you believe the feedback was unruly or irrelevant, you do have the option of reporting it to Facebook as spam by clicking the ‘report’ button. 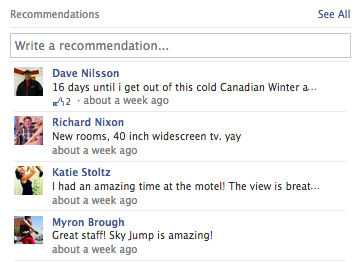 If you want to increase the number of recommendations on your Facebook page, all you have to do is ask. Post a status message encouraging your friends and fans to tell the world with a tip or recommendation. Pin this message to the top of the page for a week and see how much engagement it drives. By paying close attention to feedback on your page as well as proactively monitoring and encouraging new recommendations, your hotel will be taking full advantage of Facebook’s customer service features.